Martian family-man, Kimar (Leornard Hicks) is worried about the children of Mars and their obsession with Earth and Santa Claus in particular. 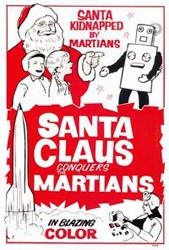 He takes the terrible advice of elder Martian, Chochem (Carl Don), flies a ship crewed with idiots and back-stabbers: Dropo (Bill McCutcheon) and Voldar (Vincent Beck) respectively, and heads to Earth to kidnap Santa Claus and take him back to Mars to bring presents to Martian kids. I’ve lost count of the number of times I’ve seen this movie (enough to know there were scenes missing in a recent revival screening that happened around the U.S. last year, much to my shame). It’s colorful and schmaltzy and without a single intelligent moment. Voldar is far and away the most interesting character and you shouldn’t feel too bad wishing he’d finish off those annoying Earth kids. Things slow down after the North Pole attack but then again it’s hard to top the charm of Torg, the cardboard robot and the fakest polar bear ever put to film. So, in summation: I pretty much love it. Hooray for Sant-y Claus!